So you've been doing yoga at home for awhile, and you're finally ready to practice at a studio. You do some research, find one you like, only to get to their pricing page and see $18 per class. Eek! With prices like that, who needs yoga? This is one of the unfortunate realities of yoga. It's rather expensive. Of course, you can go to a gym and take yoga there, but it's not the same as being in a studio where you can really further your practice. If only you could take classes for free...lucky for you, you can! Here are five ways you can take discounted or free yoga classes. Community Classes: Many yoga studios offer teacher training, where they train people to become yoga teachers. To give these students teaching experience, they often offer community classes, which are generally free of charge to the public. Off-Peak Classes: Some studios offer off-peak classes for a discounted price. They're generally in the middle of the day around lunch time when there is less attendance. 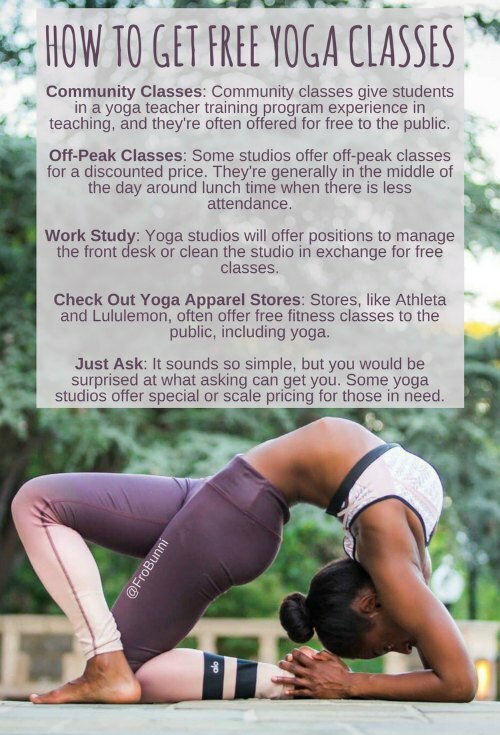 Work Study: A lot of yoga studios will offer people positions to manage the front desk or clean the studio in exchange for free classes. If you're able to commit to a couple hours a week, this option may be perfect for you. Check Out Yoga Apparel Stores: Stores, like Athleta and Lululemon, often offer free fitness classes to the public in the evening and on weekends. Because they rotate teachers, it gives you a chance to find a teacher you like before fully committing to a specific studio. Just Ask: It sounds so simple, but you would be surprised at what asking can get you. Some yoga studios offer special pricing for those in need, but they don't openly advertise for it. While others have sliding scale pricing for different incomes. And then there are some that just want you to take yoga. You never know what asking can get you. If you're interested in community or off-peak classes, just check a studio's class schedule. Athleta and Lululemon have their event schedule on their website (it's generally on the local studio website, just go to "find a store"), and inquire about work study and other pricing options in-person, which often works better than emailing. Now, go forth and practice yoga without breaking the bank.